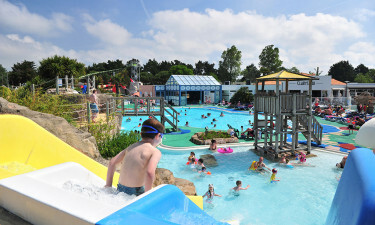 Le Clarys Plage is a holiday camping site at Saint Jean de Monts, close to the Saint Jean de Monts resort. The campsite is just 400 metres from a beautiful sandy beach, with a wide range of activities for both adults and children of all ages. 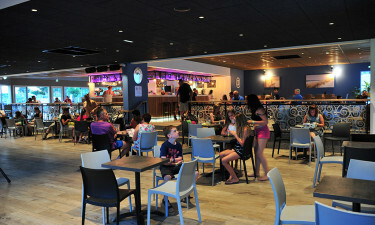 Kids will love the campsite's huge water park, while adults will find both relaxing terraces to lounge on and lively nightlife in the on-site cafe bar. Explore further afield and you will find local markets, amusement parks, outdoor activities and ample shopping opportunities, as well as local restaurants serving fantastic food. 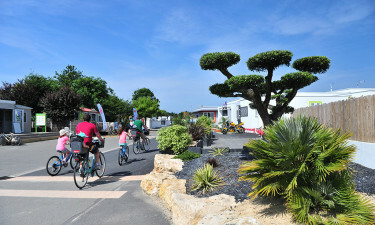 Book your luxury camping holiday at Le Clarys Plage and enjoy a holiday experience to remember! If you want to take a camping holiday without bringing your own tent, Le Clarys Plage's range of camping luxury is perfect for you. With different types of mobile homes, you'll find the perfect accommodation for your holiday here. Le Clarys Plage has extensive onsite facilities, including Wi-Fi, sports pitches, Sky TV and a full laundry. This Lux-Camp resort offers a wide range of activities for visitors, including sports facilities, a karaoke bar, fitness classes and more. The campsite's heated pool complex offers relaxation and fun, with waterslides, a crazy river, terraces to relax on and a Jacuzzi to soak in. Children will love the campsite's many play areas and Kid's Club activities, while adults will have plenty of opportunities to relax and have fun. The area around Le Clarys Plage is filled with natural beauty. Take a walk through twisting scenic paths and enjoy the stunning views, or explore the area on horseback. If you want to go a little further afield, you can take a trip to Feeling Forest and enjoy the treetop activity trails there. You'll find a wide range of food and drink options within the campsite, including a cafe bar, a pizzeria and some takeaway options. In the nearby Saint Jean de Monts you will also find a wide range of restaurants and cafes offering local delicacies and more. With a supermarket just a short walk away, there is no need to get back in your car to go shopping. Everything you need for your stay can be found here. Slightly further afield, the Saint Jean de Monts resort has a shopping area and a friendly outdoor market, where you can find local produce, souvenirs, toys, gifts and fashion.